For more information on this particular item, visit the document page for "Resume of Conference Called by Father Burke to Consider the Immigration Problem," November 10, 1920. This item is a part of the U.S. Catholic Bishops and Immigration section. 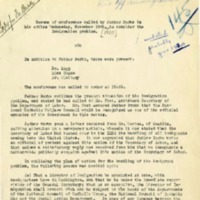 “"Resume of Conference Called by Father Burke to Consider the Immigration Problem," November 10, 1920,” American Catholic History Classroom, accessed April 23, 2019, https://cuomeka.wrlc.org/items/show/483.